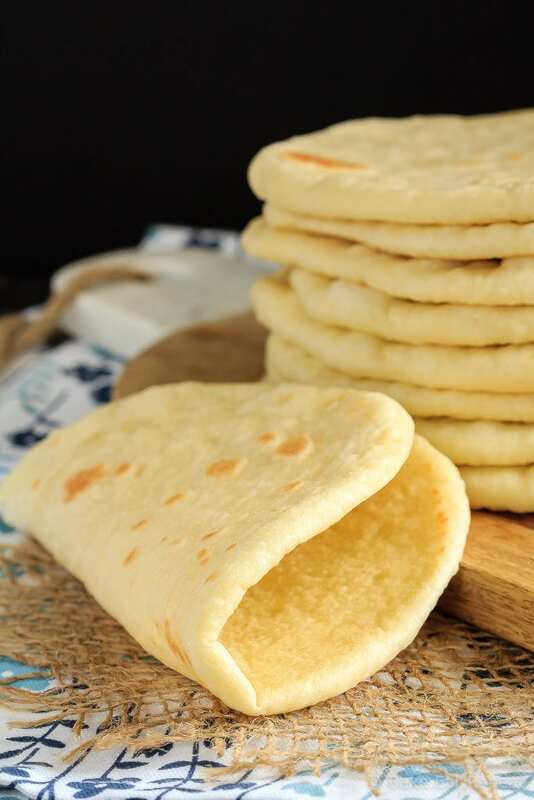 This homemade soft flatbread recipe is super easy to make and is perfect for sandwiches, gyros or even mini pizzas! 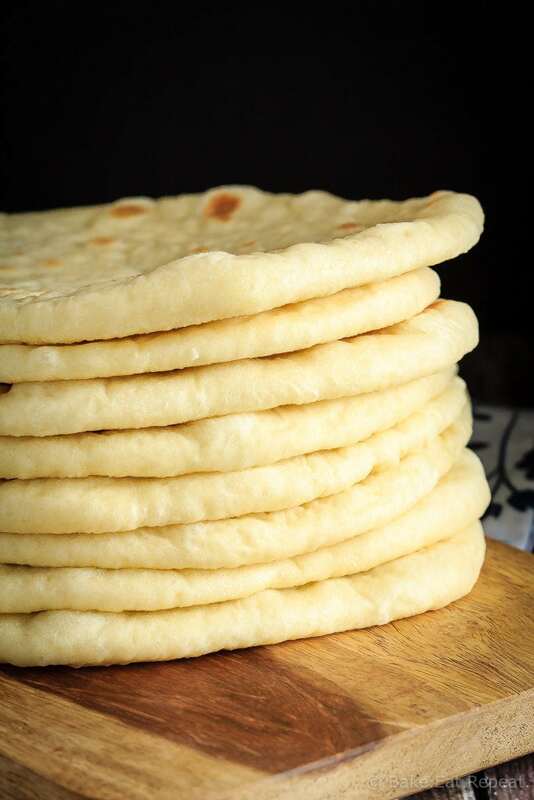 I have been looking for a fantastic homemade soft flatbread recipe for ages. I’ve had trouble finding one I love because I’m being really picky about it. I didn’t want a tortilla or pita bread or flatbread that is too thick or too thin. And it had to be easy to make and taste great. That shouldn’t be too much to ask for from a simple flatbread recipe. Evidently it is though, because every recipe I’ve tried has fallen short one way or another. 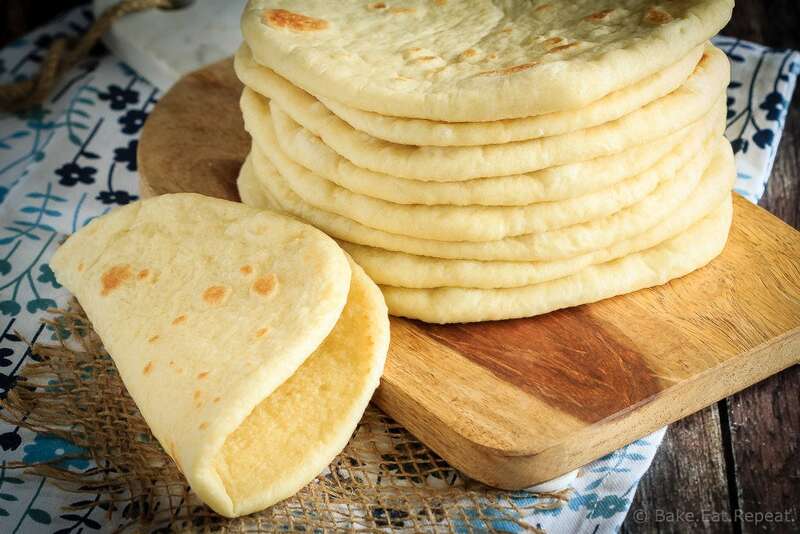 So I always end up making this pita bread or these tortillas when I want flatbread for a meal, or just going out and buying some instead (which, sadly, I’m always disappointed with). I was starting to think that my expectations were way too high and the perfect soft flatbread recipe just wasn’t going to happen for me. And then I tried this recipe and decided that this was it. This bread is soft and fluffy and easy to wrap around whatever toppings or sandwich fillings you like, it was easy to make, and everyone loved it. We have a winner! The dough mixes up very easily, you let it rise for about an hour, divide it into pieces and let them rest for 10 minutes. Then roll them out and dry fry them on an electric griddle or a non-stick frying pan. The trick to making sure they’re not too thick is to roll the circles out thinner then you think they should be because they puff up a fair bit when you cook them. No more being disappointed in mediocre flatbread – yay! some amazing recipes you can use this flatbread in: Meatball Souvlaki, Curried Chicken Salad, or Buffalo Chicken Pizza. 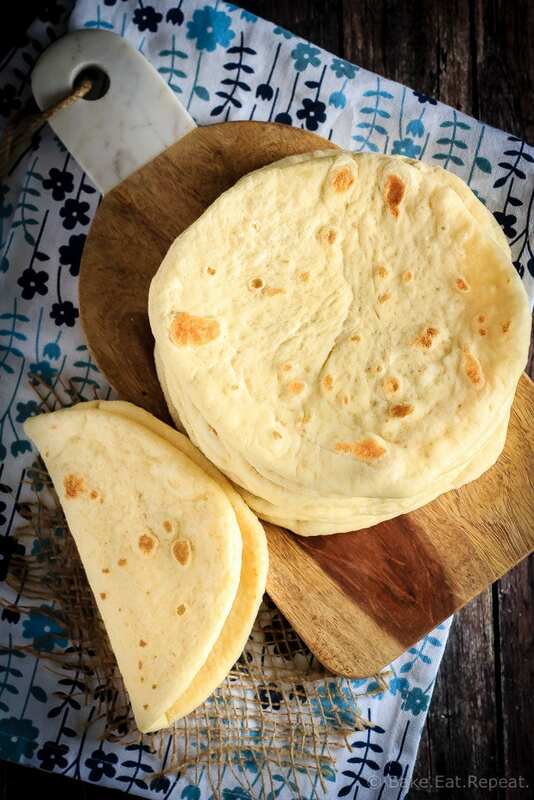 I’ve also shared this Soft Flatbread Recipe over on Food Fanatic. So good, this is a very good recipe, superb side for 'fusion' style curries too. I kneaded by hand but will use mixer next time. Hi Stacey! I can't wait to try your recipe. I have made similar ones before but the flatbread became so dry and hard during frying that I had to coat them in oil. Did that happen to yours? No, these shouldn't dry out on you, they should stay nice and soft! I find you need to figure out the right heat level though - they should take about 2 minutes on each side to cook. If they're taking way longer then that your heat is likely too low and they'll dry out on you. If they're cooking way faster, it's too high and they may be raw in the middle. I use an electric griddle on medium heat and that works perfectly but it'll depend on what you're using to cook them. On the stovetop I usually set the burner just below medium and that works well. It also helps to stack them under a clean tea towel as they come off the griddle - the steam helps to keep them soft. What a great recipe! It was simple to make and turned out exactly like it should. I did it by hand as I couldn't be bothered to get my stand mixer out of the pantry, and also I quite like kneading things. I think I will try it next time with some herbs and spices on top. This time I served it with Moroccan lentil and chickpea stew and it was perfect. Thanks for a great recipe! Hi. These look delicious! What is the best way to store them, and how long will they keep? Once they cool completely you can store them in an airtight container or a ziplock bag, and they will be good for 2-3 days at room temperature, they tend to start to dry out after that. They will keep a bit longer stored in the fridge, or you can freeze them for up to 3 months (I freeze mine in a large ziplock). Thanks! Will be making them this week. Please disregard my previous comment, I mis-read deep fry for dry fry. My apologies. Hi! I just now saw this recipe, and would like to give it a try, but I'm confused, it says to "deep fry" on a griddle or skillet. Is this fried or just cooked ona hot skillet or griddle? Thanks ! Hi, what speed of the stand mixer did you use to knead the dough for 5 min? I have a Bosch mixer so it might be different then yours, but I always knead bread dough on the lowest speed setting, which is what the manual for my mixer recommends. So I would guess you should use the lowest speed for kneading, but it may change depending on the mixer. If you check your manual it may tell you what the recommendation is for using the dough hook - if not I would go with the lowest speed. You could always extend the kneading time by a couple of minutes if you're not sure that's correct - kneading the dough for a little longer won't hurt it. Your photo looked so great, I thought I'd give this recipe a try. It's SO expensive to buy these delicious little pockets of bread, that I really wanted to bake my own! I have to say, I was surprised at how easy they were to make, and they even LOOKED like yours! They were so much tastier than store-bought! Moroccan Chicken Tagine (my first try at that, too) was the perfect dish to serve them with, because the idea is to tear off pieces of the pita, using it almost as your fork! Thanks, Stacey, for another winning recipe! I am on an almost no carb diet (50 per day). I crave bread and can't have it. I want to try this recipe with almond flour instead. Will it work? I'm really not sure if it will work or not, as I've never actually used almond flour. I think that it absorbs a lot more liquid then wheat flour (from what I've read) so I'm guessing the recipe would not turn out the same if you substituted it since it would likely need more liquid, but I really don't know for sure as I've never tried it! Can you use the dough cycle of a bread machine? Thank you thank you for this recipe! My husbands family are Greek and I have been trying to find a pita that does not puff up and form a pocket. These flat breads look like the pitas we buy to make gyros! I do not have a large mixer. Can I do this by hand? Yes you can - stir everything together with a dough whisk or a wooden spoon in a large bowl until the dough comes together. I note in the recipe instructions that you just need to knead the dough for a longer period of time if you're doing it by hand - 8 to 10 minutes instead of 5 minutes, but it will work just fine. Thank you so much for your response at 79 I never had a large mixer. Hi I just made the flatbread for supper tonight as a side. It was a hit and I love that it could go with so many different dishes. The kids wanted it in their lunches tomorrow too. Thanks.